Increasingly frequent and intense cycles of drought and flooding, environmental degradation, insecurity, weak government institutions and crumbling infrastructure have taken a huge toll on agricultural production in Somalia over the past three decades, particularly in the south-central regions. Yet, agriculture is and will continue to be central to the country’s economic recovery and development, according to a new report by FAO and the World Bank. Rebuilding Resilient and Sustainable Agriculture in Somalia, officially launched last month in Mogadishu, takes a comprehensive look at Somalia’s main agricultural subsectors – livestock, crops, forestry, fisheries and agro-processing – and their contributions to livelihoods, exports and economic growth. On 6 April, the FAO Investment Centre hosted an information-sharing event, bringing together colleagues and guests from Somalia, FAO, the World Bank and the Rome-based agencies to deepen the discussion around the report’s findings. The publication – supported by Somalia’s Federal Government Ministry of Planning, Investment and Economic Development and other sector ministries – points to major institutional weaknesses, development challenges and environmental constraints, but also to growth opportunities, if supported by the right mix of policy and investments. With one in two Somalis relying on agriculture for their livelihoods – and agriculture accounting for most of Somalia’s GDP and exports – a strong and resilient sector is crucial to the country’s long-term economic growth, peace and stability and overall well-being of the Somali people. “It’s time to compliment the emergency and humanitarian interventions toward rehabilitation of infrastructure and the development objectives, including creating jobs and facilitating access to microcredit for small-scale producers, so that Somalis can help themselves,” said His Excellency Hagi Abdulkadir Ibrahim, the Federal Republic of Somalia’s ambassador to the Rome-based agencies. 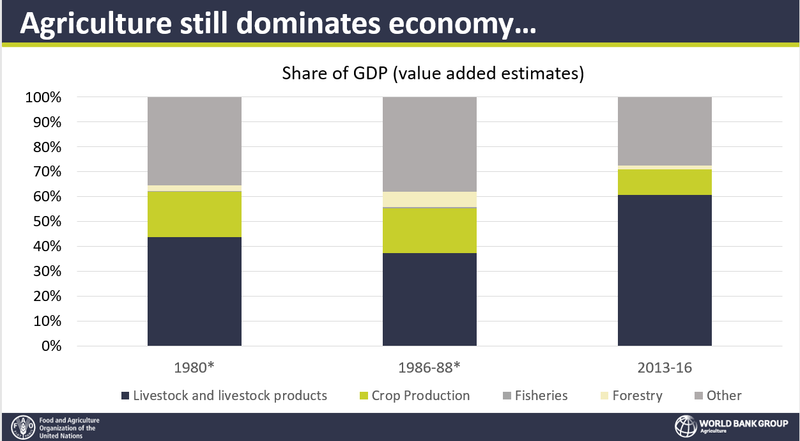 Somalia’s growing demand for food, driven in large part by rapid population growth and urbanization, has far outpaced crop production, which has declined markedly in recent decades. This has led to a major spike in agriculture imports, including food aid – worth almost USD 1.5 billion in 2015, up from an annual average of USD 82 million in the late 1980s. Somalia’s crop sector has excellent potential to recover and even surpass its pre-war production and export levels with investments to rehabilitate and scale up flood control, irrigation and water catchment infrastructure, post-harvest storage, pest management and climate-smart agricultural practices. Likewise, there are promising opportunities to sustainably develop and expand coastal and offshore fishing in the country. Considerable potential exists for sustainable expansion of fisheries, especially of tuna and oceanic tuna-like species. Equally, Somalia’s production and trade in live animals is relatively robust. “Somalia’s livestock sector is a good example of where private enterprise has flourished, especially in animal exports. 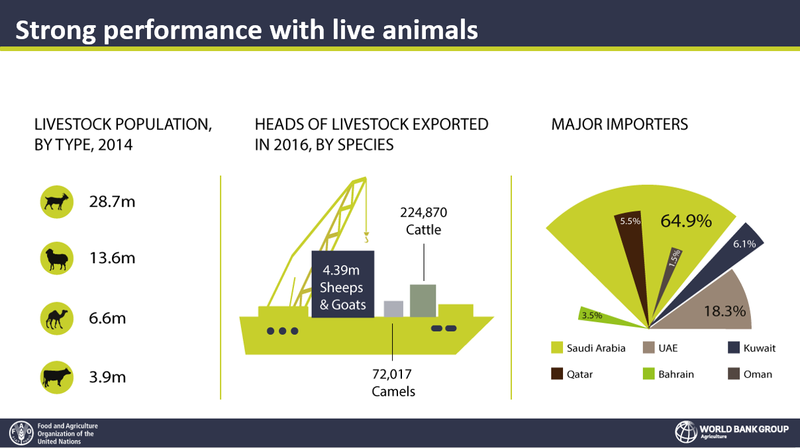 The performance of livestock products, however, is still weak by comparison,” said Julia Seevinck, an FAO investment officer and one of the report’s authors. Improving animal health and productivity, addressing feed constraints, upgrading and expanding local processing facilities and promoting value addition could help move the sector forward. While recognizing the development challenges in Somalia – insecurity, weak institutions, high energy costs, gaps in technical knowledge, climate change, persistent gender inequalities – the report advocates for a bold and forward-looking approach to support the sector’s recovery and capitalize on its many growth opportunities. It calls for more public and private investment in food and agriculture to strengthen the sector and its ability to recover from and withstand increasingly frequent and severe weather shocks. Stronger institutions, extension services and infrastructure are needed to support private investment in production and markets. “The time is ripe for international partners to support the federal and state government to take steps beyond short-term humanitarian responses to longer-term agricultural development – from increasing crop production, strengthening household resilience and safeguarding natural resources, to transforming agricultural production systems into market-oriented, competitive value chains,” said Stephen Paul D’Alessandro, a senior agriculture economist with the World Bank. “Somalia’s growing food imbalance and increasing reliance on humanitarian aid and remittances to support growing food imports is unsustainable,” he added. The report is part of a wider Country Economic Memorandum series investigating the growth potential across key sectors. It aims to help Somalia implement its current National Development Plan (2017 -2019) and prepare the next one. It is a product of the longstanding collaboration between FAO and the World Bank in building resilience and promoting sustainable development in Somalia and the Horn of Africa at large.